If you have reached our website because you are a nurse looking for the best place to practice your profession, or if you are a patient, wondering what it will be like to interact with the WGH nursing staff, we want to share a bit of ourselves with you. If you join the nursing team at WGH, you will receive a personalized orientation typically lasting 8-12 weeks. We want you to be ready to provide the care that our patients deserve and have come to expect. You can also rest assured that our staffing ratios are excellent and we do not mandate overtime. Providing you with the quality nursing care that you expect. 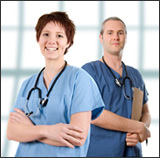 We will give you the time to provide the professional nursing care that you want to give. Sometimes being a nurse is challenging. It’s not easy to share a family’s grief and not easy to hold someone’s hand when they first hear their diagnosis ~ whether it’s a brain tumor or diabetes. It’s not easy when you are delivering the 3rd or 4th unit of blood to a patient who continues to bleed, and not easy when you are expected to be the eyes and ears of the physician, helping to problem-solve a patient’s deteriorating condition. While sometimes our work is challenging, it is also very rewarding. At WGH the nursing team works together with patients and families, physicians, social workers, dieticians, clergy and other medical professionals to ensure that our patients receive the very best possible care. Nurses are advocates! We advocate first and foremost for our patient’s safety and quality of care. We are looking for nurses that believe that there is true joy in being a nurse! We are gratified to care for patients that allow us to share in their journeys and that trust us with their health and their lives. At WGH nursing is a profession and more importantly a passion. To support with our actions the Warren General Hospital mission: “Community Health with Quality and Compassion”. To demonstrate to our patients and families, our physicians, and our peers that we are committed to providing the highest quality nursing care in a respectful, caring, and nurturing environment. -The caring art and human science that is nursing in our delivery of care across the continuum. -Fostering a collaborative, interdisciplinary approach to patient care. -The strength of our diversity. -Our skill as advocates for patients and families. -Achieving excellence in patient outcomes through continuous performance improvement using evidence-based practice. -Following ethical principles to protect the health, safety and rights of our patients and colleagues. -Patient and family education to promote an optimum level of health and wellness. -Fostering open, respectful communication to enhance understanding and healing. -A culture that supports empowerment and accountability. -Continuing education that fosters professional growth, competence and critical thinking. -An environment that nurtures and supports accomplishments, confidence, and a love of nursing.